This high school pearl competition features weekly knowledge-building challenges, during which pearls perform knowledge gained demonstrations. 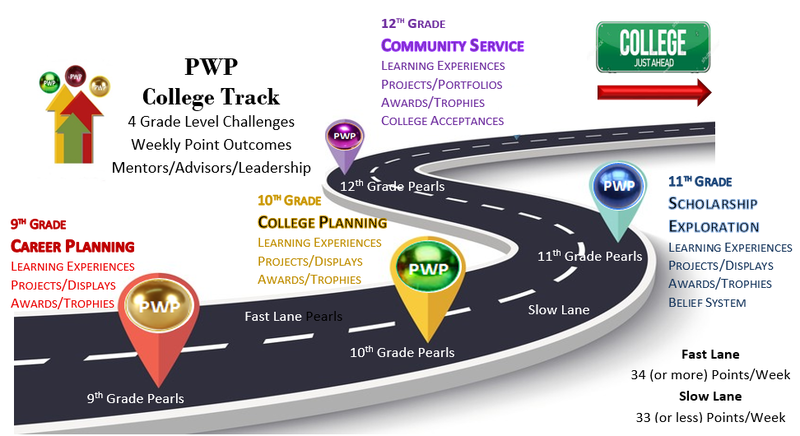 Knowledge points are based on the following: 1) Course Selection, 2) Course Completion, 3) Grade Point Average, 4) Career Plan, 5) Self-Paced Personal Learning Experiences, 6) Events, 7) Mentoring 8) Peer Nurturing, 9) Awards Luncheon. R1 Pearls (register in semester 1) must earn 400 knowledge points to complete this phase. R2 Pearls (register in semester 2) must earn 200 knowledge points to complete this phase. Course Selection and Completion, Grade Point Average, College Plan, Skills Development, Awards and Special Recognition, Self-Paced Personal Learning Experiences, Mentoring, Point Progress Monitoring, and Peer Nurturing. 800 Knowledge Points Are Required to Complete This Phase. Course Selection and Completion, Grade Point Average, College Funding Plan, Scholarships, Skill Development, Awards and Special Recognition, Self-Paced Personal Learning Experiences, Mentoring, Point Progress Monitoring, and Peer Nurturing. 1,200 Knowledge Points Are Required To Complete This Phase. Course Selection and Completion, Grade Point Average, Community Service, Leadership, Skill Development, Awards and Special Recognition, Self-Paced Personal Learning Experiences, Mentoring, Point Progress Monitoring, Peer Nurturing, and College Acceptance Letters. 1,600 Knowledge Points Are Required To Complete This Phase.